Herb and I had a wonderful holiday recently. We went to Australia and spent 10 days in Sydney with my daughter Rachel. Each day was fully packed with something new to do. The weather was really good; we were there in mid February staying with Tom’s (Rachel’s boyfriend) family. Rachel had all the time off and we had a super time. Gorgeous beaches nearby, lovely walks, Hunter Valley, ferries to different local places, much eating out, a visit to the National Park and caught up with an old friend of Herb’s. The one thing that surprised me was a trip Rachel suggested which was 15 minutes away. Botany Bay where Captain Cook first landed in Australia. I had no idea Botany Bay was by Sydney-for some reason I assumed Cook landed in the Northern Territories or Queensland.We had a good wander and the little museum was very interesting. 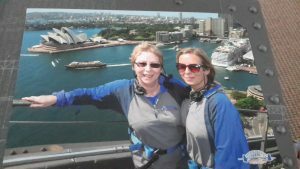 A big highlight was Rachel and me climbing Sydney Harbour Bridge. It was a Christmas treat and really good fun. No fear, never felt vulnerable and it is extremely well organised. Certainly a highlight. Although sad to leave my daughter I trust I have my head sorted about it and I wish her success, happiness and all good things. She has a lovely Australian family who love and help her and I am very grateful for that. We thoroughly enjoyed Thailand. I hadn’t expected it to be quite so warm but if you drink plenty water and don’t exert yourself too much it’s fine. Well it was for me; Herb lost a week through probably not drinking enough water. We did the tourist things and did enjoy the Temples, stunning really. Bangkok is crazy traffic wise, crazy- very busy. We journeyed north to Chang Mai and loved the Elephants Sanctuary and the ride on the elephant. (And I have only read the bad stories about elephant training since coming back. A difficult Catch 22 situation, however I believe the elephants are now being treated much better in Chang Mai and hopefully the rest of Thailand. Our Housesitters had actualy worked in a Dog Sanctuary in Chang Mai and gave us much information on our return. They were also polite and didn’t make me feel I had blatantly been part of possible abuse to animals ). THEN we had a week in Koh Samui in a gorgeous hotel and were upgraded (honeymooners) to a room/suite with our own private pool. Result! (Thank you Angela Guilfoyle of Travel Counsellors for organising the whole trip). The highlight was the sea. We love swimming in the sea and swam before breakfast and often during the day. Just glorious, great waves and less worrying than the Australian waves which I treated with great respect!